Anglers are always asking, what baitcasting reel they should buy for bass fishing, why they even need a baitcaster in the first place. There was a time when baitcasters were used only for tournament fishing or bass fishing, but times have changed. People nowadays use baitcaster reels for light fishing and worm fishing. To keep up with the pace, this article will help you find the best baitcasting reels for the money. If you are in a hurry why not check out our #1 pick. PERFORMANCE - Low profile design bait caster with a super silent high speed 7.0:1 line retrieve. 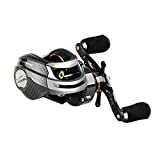 UNMATCHED - Precision cut brass gear structure and carbon fiber drag system delivering 17.5 LBs of drag offer the ultimate in a high performance low maintenance baitcasting reel package. PROVEN - 11 + 1 shielded MaxiDur corrosion resistant ball bearings for super smooth casting, retrieve, and long life. TOURNAMENT READY - The new Royal legend bait caster has state of the art dual brakes with a quick, easy to fine-tune reliable centrifugal and magnetic brake system for superior casting control. DYNAMIC - Two color anodized aluminum forged multi-ported whiffle-style spool offers maximum strength while reducing weight. 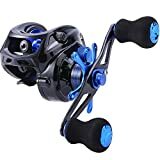 We have considered the quality, performance and most importantly the price of the reels and came out with some of the best offers in the market. If you don’t understand any of the terms than you can go to the parts of a baitcaster or buying guide. Hopefully, you will find your answer. Piscifun Torrent might just be the best one when it comes to price and performance comparison. It is just over 39 dollars. But it gives you a stainless body. It is very light and comfortable. The body and all other parts are corrosion free in both sweet water and saltwater conditions. It has 6 bearings. The handle here is slightly bigger. It is 4.33 inches. So you will have a slight leverage with this reel. It is fast. It has a 7.1:1 gear ratio. It can handle a large spectrum of baits. It is good for baits that touch the bottom like crank baits, spinner baits and all kinds of Alabama baits. Your bass might just be tired to keep up with this bad boy. The spools ITP is 30. And its capacity is 120/10. Meaning it can hold a line of 120 yards weighing 10 pounds. And the carbon fiber drag is 18 LB for a 120-yard line. So it can carry any trophy fish like bass or big pikes. Another special feature of this reel is the company promotions. Piscifun tends to give very lucrative offers like buy to get one free and other stuff. If you are low on cash you can exploit this opportunity. This is the bait caster for beginners. Very less price compared to size and durability. You don’t see this type of reels in the market very often. Best bearings as it is shielded. Unique lubricating port on the sides. This a heavy duty reel. But amazingly light. It is made up of a strong aluminum alloy. It is just 7.7 ounces. Very easy to handle. This low profile reel EBA foam grip while a logo of the company printed on it. It looks very cool. The gear is 7.0:1. It is very fast. KastKing is very good for flipping and pitching. You rock the waters with this fast rider. You can put any bottom fishing bait on it and it will do just fine. Crankbaits, Carolina baits, and Texas baits are the favorites with this reel. The reel is very smooth. One of the smoothest I have ever seen in fact. It has 12 bearings, 11 bearing balls, and 1 roller bearing. This makes it go very fast. And the mark of a good bearing, the shield is also present. It prevents dirt and other things to get in the balls way. The breaks of this reel are very advanced and well protected. It has an inner centrifugal break controlled with 4 pins. Turning each pin on will increase the power of the break. And there is also a magnetic brake. The capacity of the reel 165/12 lb. The reel can resist 17.5 lbs. of drag. So you can catch almost all kinds of freshwater fish but be careful about putting big baits. The problems that I have faced with this reel are that they were really hard to tune. It was really hard to get in the perfect break and drag zone. But once after you will hit the spot hours of angling will not make you tired. You will not regret buying this piece of Swedish engineering. The material compounds have been chosen with a level of delicacy. When hearing its different body materials, it sounds like a tale of a group of craftsmen crafting a perfection. Its 7.3 ounces is made up of aluminum spools, dura gear and graphite frame and side plates. We all know about aluminum. It’s the lightest metal. Duralumin is an aluminum alloy used generally in aircrafts to make them lighter. So you can guess how far the Swedish went when building a reel of their favorite sport. The graphite is another light material. But it has some drawbacks. Graphite is brittle. It is very hard but tends to break. But as far as I have encountered it I haven’t seen anyone break a reel. Some cases of breaking a graphite rod are not that uncommon but yet you have to be careful with it. But the lightness comes with it is a price that you sacrificed for the durability. It is highly sensitive. What is the problem buying a less durable reel if you can have more fun with it? The marginal benefit is way more. It has a 6.4:1 gear ratio. Very moderate number. You will have no problem catching big or small fishes with it. It is the most preferred gear ratio. For having a relatively less spool diameter it has an ITP of just 26 inches. And the release button is a little noisy. The brake system is MagTrax. It will ensure your long cast’s safety from backlashes. Its capacity is 145/12. Its power disk ensures 18 lbs. of drag enabling you to look for a vast spectrum of fishes. The bearing number is 4+1. STOPPING POWER - gives you smooth, impressive 4 disc carbon fiber tournament ready 16.5 Lbs. (7.5 Kg) drag that stops them dead. DUAL BRAKES - dynamic 6-pin centrifugal and magnetic brakes for laser focus casting accuracy, even with wind drift, lets you hit the bullseye every time. KastKing has earned their name with this reel. It is the lightest of all reels just 5.7 ounces. Extremely sensitive. It will feel like having a hawk’s eye under water. I haven’t shot it but KK claims that it is ‘Bulletproof’. The side plates and the frame body is all carbon. The spool is CNC/ anodized aluminum. No wonder it is so lightweight. Beautifully engineered. The gear is grade hardened aluminum. The gear ratio is 6.3:1. Moderately fast. Good for a wide range of fish and baits. There is a 4 disk carbon fiber drag which can hold up to16.5 Lbs. The drag is amazing. The best you can get in this price range. Another amazing feature is the dual break. Centrifugal breaks have generally 4 pins in this price range but it has 6. But there is also a magnetic brake. In just a short period of time, you can be very accurate with this if you can tune that correctly. It works even in the high winds and thick cover. Another bomb in the MxiDur ball bearings. 11 bearing balls and 1 roller bearing (11+1). Makes it the reel having the most balls. Hope you can match yours with it. The reels capacity is 12lbs. And the IPT is 26.8. If you are like me you will just buy it for its color. The blue shades made it just beautiful to look at. The grips are EVA padded foams. This reel is very balanced in every way. Nothing is too much or too less. They have sacrificed noting here. But the materials used to make the physics of the reels are very good. It might just last your whole fishing life. For that, I would say they might have sacrificed their profits a little. The best when comes to weight and sensitivity. Most bearings you will get under the certain price range. It has the best looks. Centrifugal breaks are easy to tune. 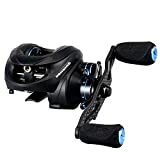 UNMATCHED -Sougayilang Magnetic Tuned brake delivering 12 lbs/120yards of drag offer the ultimate in a high performance of baitcasting fishing reel. SMOOTH-CNC machined aluminum spool, High-tensile gear, aluminum high speed 7.0:1 gear ratio, superior shielded 9+1 corrosion resistant ball bearings. ACCURATE - Magnetic Brake System gives consistent brake pressure throughout the cast. has a adjustable button on the reel surface.magnetic force from 1-10. PERFORMANCE - Low profile design with low noise gear structure delivers the ultimate performance.better Stability, reduce the birds nest.suitable for novice and skilled. LIGHT AND STRONG - Silver color anodized CNC Machined aluminum forged spool offers maximum strength while reducing weight.Stain steel gold handle makes stronger for fighting with fishes. This beast is a heavy duty Sougayilang reel. CNC Machined aluminum forged spool offers maximum strength while reducing weight. The handles are gold metal making it a little slippery. Even the ball bearings are steel plated to resist corrosion. And it does resist in both salt and sweet water. But all this steel increases its weight to 8.8 ounces which is a lot when we are discussing sensitivity. So it might be a little behind in catching small fishes. But who wants to waste all day to catch tiny fishes. It’s for drawing out monsters from the debt of waters. It has a 7.1:1 gear ratio. So it’s fast. Very fast. It helps you catch up with the fish. Best baits for this gear are crankbaits, spinning baits Texas baits and many others. The spool capacity is 120/12. They could have done better at this. It can hold up to 120 yards of line weighing 12 pounds. You can hook up big heavy baits with this reel. The drag is 12 pounds. So it can handle almost every kind of fish and lures. And a different thing I noticed in the reel is that prevents backlashes very finely. The spool is always smooth and runny and the breaks are dead drop accurate. So feel free to cast long distances from the shore. This a futuristic looking reel. Its low noise and very stable. Every component of this reel is designed to catch huge monsters. Likely in the sea. That’s why it has so much protection from corrosion. Very good for new anglers. If the reel is from Shimano, there is hardly any possibility of something going wrong. So let’s see what’s this shiny reel is made of. Firstly the Shimano Caenen baitcaster has two models one is 150A HG and the other is 150A. Both of them are similar in almost all aspects but some. It is very fast and will be very easy for beginners. Almost all kinds of baits are suitable for both kinds of reels. Lipless crankbaits, spinner baits anything. The HG is better with the spinner baits than the other one. The reel has 4 ball bearings and 1 roller bearings. The bearings are shielded. The reel is very smooth. The High-Efficiency Gear (HEG) ensures long-term durability. The Shimano Stable Spool Design (S3D), paired with the Variable Brake System (VBS) will give you a smooth cast every time. The drag system can hold up to 11 Lbs. you can get it with a mono line capacity of 10/105, 12/85, 14/70 and PowerPro line capacity of 20/150, 30/135 or 40/105. Well, some Shimano fans might take it as a blasphemy but I had to say the following problems I had with the reel. For me, it was very annoying to open the side plate every time I wanted to change the breaks. The metal body with the glitters looks amazing. Sometimes the side plates stick to the frame. The release clip is curved to the other side of the handle. The Perseus is a very strong and powerful reel. The moment you touch it, you know that it is strong. But it is not its power which grabs my attention. It is its design. The Perseus has many features that are not common to the market. Like the double line winding shafts. It has a 6.3:1 CNC brass gear system. Medium fast retrieve. Good for almost any jigs, spinners, Texas and Carolina rigs. Its drag capability is 18.5 Lbs. making it suitable for any cover. It has a double break. One is a 6 pin centrifugal brake.Which are well designed to transform? On top of that, there is also a magnetic brake making the cast very easy to control. The casting with this reel is very accurate. The capacity of this reel is 120-yard line of 10 pounds. This reel is very smooth. It runs on 6 bearings. The bearing balls are shielded. And the stainless steel provides protection from corrosion. It is very comfortable. You can fish all day long without any problem. It weighs just under 8 ounces. When I was talking about the design I was talking about the special features that it has. Apart from the great blue looks, the reel has a 4.33 inches handle. The grips are a hard kind of rubber which will even support you in wet conditions. There is also an oiling hole on the side plates of the reel to make it very easy for lubrication. Unlike most other reels you don’t have to open the side plates every time when you want to oil your reel. Lew’s earned their success with this reel. 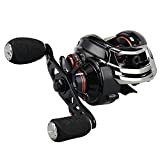 It might seem a little pricey compared to the other reels we have shown here but for the money, you will have a hard time finding a better one from this. Like we said before if you pay more in the fishing reel world you will not be disappointed. This reel has a full aluminum body. The frame, side plates, spool and even the knobs and drag wheel are all aluminum making it ultralight. it is very fast. The 8.3 gear can pull more than 35 inches per turn. It is very helpful when frog fishing or with spinner baits. This reel comes in four gear ratio. So you have a lot of choices. The gear ratios are 5.6:1, 6.8:1, 7.5:1 and 8.3:1. I don’t know how Lew’s did it but all of them are the same weight. They are all 6.7 ounces. They all (without the 5.6 gear) have the same capacity which is 120/12. Which means you can put a 120-yard line weighing about 12 pounds. But the 5.6 gear has a better line capacity. It can hold up to 150 pounds of line. This is the only difference though. It is very smooth and it will be like this for a long time for its double shielded bearing balls. They are corrosion free. Absolutely no worries in salt water. Most of the saltwater fishermen use these type of reels. It has a U shaped aluminum spool. The reel also comes with a double braking system. I never had any backlashes or anything near that with this reel. It has a carbon composite drag system with 14 Lbs. of drag. The drag is also very smooth. Try this reel. You will not regret. Dual Braking System can cast farther, very easy to use and set up to prevent backlash and controll fishing line better,especially when you are catching a big fish. This is a low profile aerodynamic design bait caster with a super silent high-speed precision gear structure and carbon fiber drag system. The materials used to make this reel are pretty exceptional. To give it the ultralight status it enjoys today the designers of fish drops decided to go for fiber more than metal. They infused high strength nylon with glass fiber to make the ultimate light frame and side plates. They choose aluminum for the 18 bearings the reel has. Yes, I know, it’s crazy. But they did it anyway. It would be better if they would install shields too. It has a CNC machined 7.0:1 copper rotter gear. It’s fast. Very easy and fearless casting with the when you have its dual breaks. You can control your bait finely and hit the bull’s eye every time. The side plates are easy to release so you will have no problem changing the break pins or lubricating the spool. You also have a carbon fiber drag system with this reel. The drag is very smooth. If you set it accurately than you will have the taste of real fishing. And the drag and breaks are all easy to fine tune. Its performance also ranges to comfort with the EVA knobs and prolonged handles. You don’t see these very often. It is one-way clutch. But the best I thought the Fishdrops folks did was the R&D on this. They tested it with professional machines and pros for over 3 years. Now that is some testing. So, I guess, the reel will at least stay 3 years with you. High strength nylon + glass fiber material and side plates. Thinking of going big, aren’t you? For big fishes and almost everything else, baitcasters are the perfect thing. But wait up buddy, not too fast. The bait caster, if used without the right technique, can make you even quit fishing. Yeah, it’s that bad. Especially backlashes or birds nest. There are other problems with casting lighter lures and noise but the backlash can make you feel like hell. But my friend, fear not. We are here to save the day. Just read the instructions below when buying your bait caster. We have also provided analysis of several baitcasting reels. We ranked them for your ease and picked the one that we thought would be best for you considering from price to performance and everything in between. We have also listed some techniques that will help you get out of some frustrating problems. A bait caster is the most advanced reel and the most complex tool for an angler. There is nothing like it. Here we are identifying and describing different parts of a baitcasting reel. If you already know about the parts of the reel than we would suggest to skip it but for the beginners, it’s a must know thing. And if you know the reel partly than you can just read the parts you don’t know about. Gear & Gear ratio: Gears are by far the most important part of a bait caster. Gears are used for quickly retrieving the line. Now, what’s a gear ratio? It is the ratio of the number of revolution of the spool to per turn of the handle. Generally, gears are used from 5.1:1 ratio to 8.1:1 ratio. Anything below the lower mark like 4.1:1 is too slow any anything above the higher mark like 9.0:1 is too fast. Though the fast ones are very useful in some cases in high cover it will wear you out. Frame: The body of the reel and spool is called the frame. Generally, they are made of lightweight materials and also carbon fiber. Some reels also contain alloy metals. Spool: The wheel where the line is wounded is called the spool. Spool release button: The button going across the spool which locks and unlocks your spool is the release button. You place your thumb there and use it when necessary. Spool tension wheel: The wheel on the side of your handle which regulates the tension of your line is the tension wheel. If we tighten it, the spool will spin slower and if we soften it, the spool will spin faster. Braking dial: It is a dial placed on the right side of your reel. It prevents the free spinning of your spool preventing a backlash. Drag: The drag is the starfish-shaped wheel with your handle. If you turn it back the drag loosens and if you turn it forward the drag tightens. Line guide: Line guide is the hole from which the line exits the reel. It moves left and right to distribute the line evenly on the spool. Bearings: Bearings are located inside the reel. The handle and the spool are attached by the bearing creating that smooth handle. Anti-reverse / Zero reverse: Not all the reels have this feature. And among the many having this feature, some might not have a switch for turning it on and off. It is generally located on the top of the reel. Here is everything you need to know when buying a fishing reel. Just keep in check the following points, your budget, and your preference. Budget: In the baitcasting world, the more you will pay the better you will get. So a good reel depends largely on your budget. Nowadays there are reels from 40 dollars to 400 dollars. 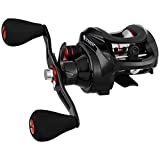 But for beginners, there are a lot of good reels from 35$ to 150$. 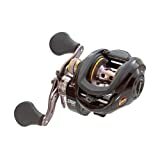 Also, check out other popular best spinning reels in this price range. Gears: The 5:1 ratio reels are good for high drag baits like big crankbaits. The lower the gear the easier to turn the spool. The 8:1 ratio reels are good for any bait that will make contact with the bottom. It’s easy to flip and pitch with this as you can get the bait back very fast. Use it for Carolina rigs, Texas rigs, Alabama rigs, and jiggers. Another great advantage is, it helps you catch up with the fish. Sometimes when you are fighting with a bass and it swims towards your boat really fast then you need to retrieve the line as quick as possible. The middle ratios 6:1 and 7:1 has the good of both. Other than the bottom baits they can be used in any situation, with any baits. if your budget allows you to just one we would suggest you go for a 6.4:1 ratio. IPT: Inches per turn tells you how many lines you pull in at each turn of the handle. It is closely related to the gear ratio. But it gives you a better understanding of the reel as the amount of line pulled can vary depending on the handle and spool size. Frame materials: The best materials for the spool & frame is magnesium. Aluminum and carbon fiber are widely used in less pricey but good reels. Though very cheap try to avoid polymer plastic. It is not durable. Better reels use compound materials. Lighter is better. But better is also costly. We would suggest going for the highest you can pay for it. Comfort: See if the size, knobs, and handles make you comfortable. It is your personal choice. Don’t pick a reel that has a slippery handle. Spool size: The bigger the diameter of the spool the easier it is to pull the bait back. And it also makes the line more manageable. So go for a slightly bigger one but not too big. Spool release button: Make sure it is smooth. Spool tension: It controls the begging of the cast. Just like we said before, if we tighten it, the spool will spin slower and if we soften it, the spool will spin faster. When buying watch closely the differences of the spool speed in different stages of the tension. The more you feel the difference the better the reel is. Spool break: The breaking controls the end of your cast. When your bait falls on the water or has made slow by the wind or any other cover, the spool will not stop spinning. But if you tighten the break, under those circumstances, the brake will make the spool stop spinning saving you from a backlash. Dual braking systems are the best. At the time of buying apply the same treatment as the spool tension. See if it breaks well by measuring the differences of each step. See if the centrifugal braking system is easily manageable and how many pins it has. The more the merrier. Capacity of the spool: On the reel or on the box there will be a large number than a slash (/) and a small number. The large number is the amount of line you can fit on a spool measured in yards and the small number is the weight of the line the spool can handle measured in pounds. Like a 110/10 can hold a 110-yard line weighing 10 pounds. The folks who are laughing at me now for giving a definition like that should know that in some cases the information is so vague that no metrics are provided. You might know it but many don’t. If you are going to fish big like bass and catfish, anything around 110/ 12 should be good. Here more is not merrier. Too much line will make the reel heavy. Drag system: The drag is an adjustment that you can make in your baitcasting reel that will prevent your line from breaking by making resistance against that tension. It will be your best friend when catching big fishes with lower capability lines. Look for carbon fiber drag. Star drag systems are common in the market now. When you are in the market try putting a line and pulling it to see if the drag is working accordingly. Line guide: See if it moves smoothly. Bearings: The number of the bearings are not a big deal. But do not buy one with less than 4 balls. But make sure that they are sealed, shielded or double shielded. It will prevent dirt from getting into the bearing subsequently reducing the friction. And when you are in the market try free spinning the spool and observe which one spines the longest. Anti-reverse / Zero reverse: This feature prevents the reel from turning backward. In some reels, you will find a reverse switch to turn it on and off. Don’t buy one that doesn’t have it. Audibility: Audibility means it if there is a clicking sound on the tension knob or the breaking dial. Some star drags also have some audible feature. Sometimes it plays a big role when you are in action in the water. So go for maximum audibility. Right or Left handed: You might not consider it a big deal but it is. You see if you are right-handed than you should choose a left handed reel. Why? 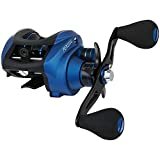 Because, if you use a right-handed reel than after casting with the right hand you will need to shift your reel from right hand to left hand and then reel back your bait. This shift can cause a problem. So, you might want to choose the oppositely handed reel from the hand you are going to fish with. 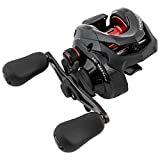 There is a lot of research related to picking the best baitcasting reel. And it varies person to person. But some folks take it to another level. 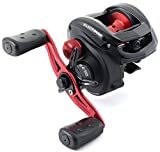 Considering the feelings of all those serious fishermen and the freshmen of this fishy world we picked Piscifun Perseus Baitcasting Reel to crown the number one spot in our ranking. It has the best marginal benefit of all the reels. But if you want the best reel regardless of the cost go for Shimano Caenen Baitcast Reel.